Manchester's history as a city really only begins with the Industrial Revolution. Until then, it was little more than a market town. There has certainly been some form of settlement on the present-day site of Manchester since Roman times, when a fort was built at Castlefield. After the Roman withdrawal from the fort at Mamuciam around 410 AD, the town fell into ruin. In 920 AD, the Saxon king Edward the Elder took over and succeeded in restoring the town's fortifications. Following the Norman invasion of 1066, the land in and around Manchester was divided between several Norman barons. Albert de Gresié acquired the Manor of Manchester. His family were to hold the manor for the next two centuries. By the 14th century, Manchester had is own annual fair, held on the present-day St. Ann's Square, as well as a weekly Saturday market. Although still ruled by a Lord of the Manor, the town now had its own mayor to handle day-to-day dealings. By 1322, there was thought to be a mill in operation - a sure sign of Manchester's beginnings as a place for textile manufacture. In 1422, Thomas de la Warre, the new Baron of Manchester, founded a college and a collegiate church. The site of the college is now home to Chetham's School and the church became the cathedral. These two buildings remain at the heart of the medieval quarter. In 1596, the Lordship of the Manor was acquired by Sir Richard Mosely, a former Lord Mayor of London. At the outbreak of the English Civil War, Manchester was widely seen as a Parliamentarian stronghold. Consequently, it was besieged by Royalist forces in what is considered to be the first siege in the war. The siege was unsuccessful, however, and at the end of the war, the town's loyalty was rewarded by Oliver Cromwell, who presented the parliamentary mace to the town. 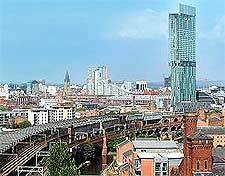 By the mid-18th century, Manchester had grown considerably, becoming the most populous town in Lancashire. In 1759, work began on the construction of a canal to transport coal from the mines at Worsley. The Bridgwater Canal was linked to several wharfs, with the first one to be built based at Castlefield in 1765. By the 19th century, mechanisation had well and truly taken hold of Manchester, leading to a boom in industrial activity. Huge mills were built to manufacture textiles. New warehouses sprang up, followed by trading exchanges and banks, and city status was granted in 1854. A wider network of canals was also put in place and the town boasted three railway stations - Liverpool Road, Victoria and London Road. It was the coming of the Manchester Ship Canal that turned this land-locked city into a sea port. The canal took seven years to build, finally opening in 1894. Throughout this period, those who worked in the city's factories and mills lived in increasingly poor circumstances. By contrast, many of the wealthier merchants and mill owners had moved into the ever-expanding suburbs. 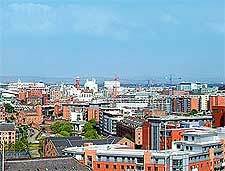 As an important port and industrial city, Manchester suffered a great deal during World War Two. Many of its textile factories were turned over to armaments production, making them prime targets. In December 1940, the city experienced a devastating air raid that hit many of its Victorian buildings, including the Free Trade Hall and the cathedral. Since the IRA bomb of 1996, Manchester's appearance has changed dramatically, bringing about the redevelopment of the city centre. 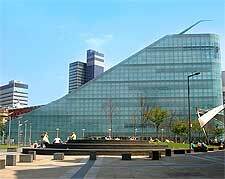 As a post-industrial city, warehouses and factories have largely given way to apartment and office blocks, arts centres and, more recently, the BBC's Media City.